I adore Le Blog De Betty she is so stylish and adorable. I love how she always finds the the perfect H&M and Zara pieces . I also have never seen a girl rock a Michael Jackson thriller jacket like she does! She also wears this adorable bow necklace (bows are her trademark). I am inspired to get one. If you want to see one stylish girl from overseas take a look at her blog! 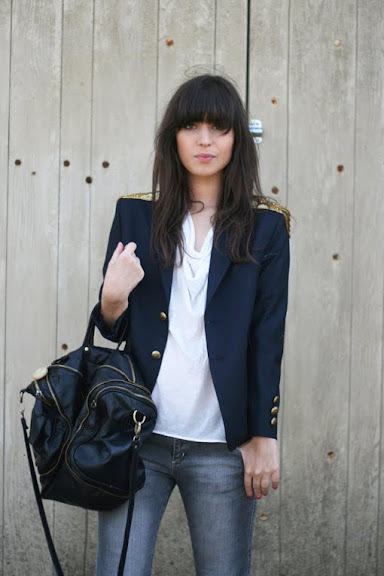 I want the blazer with the gold buttons! I need blazers for the fall. Any suggestions? Let's go to the city! I know..let's. Topshop has some cool ones. I love the silk one! ah i NEED those YSL cage heels! gorgeous. P.S. you won my yoga dvd giveaway! shoot me an email for the details! Totally! !I'm a fan of hers also..she was the one that got me all crazed over sequins haha..
What a cute girl, she has a pretty cool blog i must say, and so do u! I really mean it, keep up the really good job! Ill definitely come back! I love Betty's blog toooooo. P.S. : Thanks Ur lovely comment. Check my blog at another time if U have a mood. :-) I can do with Ur blog. LOL! Thanks also for the lovely comment on my blog. I don't think Betty ever takes a bad picture! all her outfits are soo damn wearable, i love it!! I love the jacket and jeans ensemble. The white T + the black leather bag! Great!